A Chinese Border City Gives Tourists A Glimpse Of Life In North Korea : Parallels From Dandong, across the Yalu River from North Korea, middle-class Chinese tourists can buy North Korean cigarettes and souvenirs, and gaze through binoculars at North Korean farmers plowing fields. 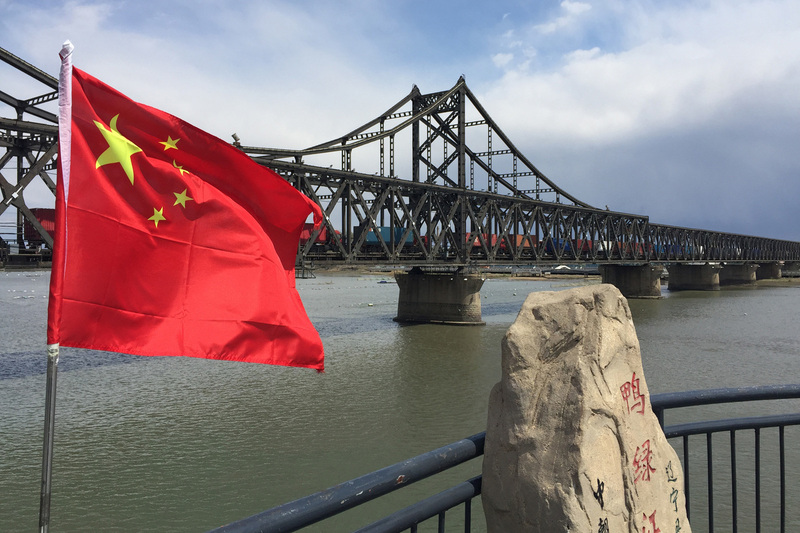 The China-Korea Friendship Bridge crosses the Yalu River from Dandong into North Korea. Seventy percent of North Korea's trade passes over the bridge. But the tension feels distant on a boat upstream packed with dozens of gleeful Chinese tourists, all headed to the North Korean side of the river, hungry for the exotic. The ferryboat glides away from the skyscraper-lined Chinese side of the river into a channel of the Yalu surrounded by North Korean countryside. Tourists gaze through binoculars at North Korean farmers too busy plowing land with their water buffaloes to notice. It's a beautiful, pastoral sight on a sunny spring day. But to the ship's captain, it's a scene worth mocking. "What's the difference between dark-skinned North Koreans and light-skinned ones?" the captain asks over loudspeakers, launching into the first of several bigoted jokes. "The dark ones are sunburned and the light ones are starving!" 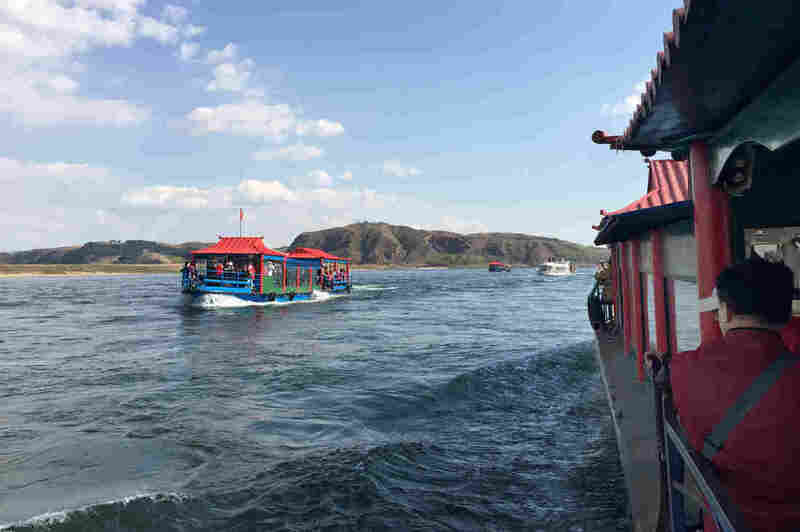 Chinese tourists ride ferryboats to the North Korean side of the Yalu River. The Chinese tourists laugh as the North Koreans continue to farm on the shore. For decades, Dandong, in Liaoning Province, was a gritty industrial port, but in recent years, it's been reincarnated as an entry-level tourist destination, a place where members of China's new middle class can get a first glimpse of a foreign country. Think Tijuana for 1960s American tourists. But the city's not all crude humor and stereotypes. Walking by vendors selling North Korean cigarettes and Kim Il Sung lapel pins along a riverside walkway, 70-year-old tourist Song Wende makes a measured call for peace. "America needs to approach this problem peacefully," Song says, wagging his finger. "You can't solve it with the use of force. North Korea is simply defending itself against U.S. aggression with nuclear tests. It's poor there. They wouldn't be wasting money on weapons unless they had to." Fellow tourist Wang Ye isn't sure about that. The 50-year-old from nearby Jilin Province walks along Dandong's Broken Bridge, built by the Japanese nearly a century ago and bombed by the Americans in 1951 to cut off supplies from China to North Korea during the Korean War. He says he's sick and tired of Kim Jong Un, whom he refers to by his popular Chinese nickname, "Jin San Pang." "Fatty Kim the Third isn't good to China, yet we still help him," complains Wang. "North Korea's so poor. Just look at it over there! How can he do this to his own people? He's gone way over the line. He's asking for it." Li Jun, whose family spent their lives moving back and forth across the border, hopes it won't come to that. Her family escaped famine in China in the 1950s, and then another famine in North Korea in the 1990s. Now Li runs a Dandong restaurant whose balcony overlooks the North Korean countryside. "They live in rural production teams over there," Li says. "They farm and eat together in collectives. Tourists come to this side to take a look. But if war breaks out, nobody's going to come here, right?" Gu Yu envisions a more hopeful future. She gives tours of luxury condos in a development named Moon Island, a man-made island south of Dandong featuring a view of a $320 million suspension bridge constructed by China in 2013. It remains unused due to North Korea's refusal to build a road to it on the other side of the river. 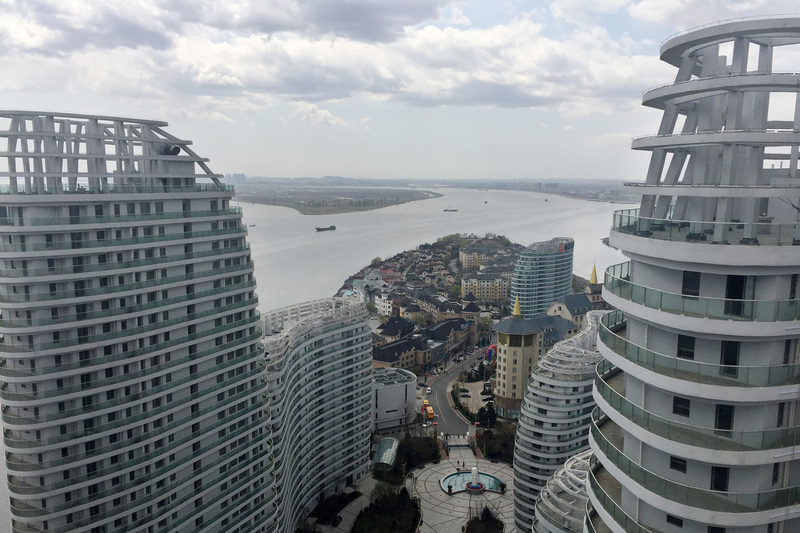 Luxury condos rise over Moon Island, a development south of Dandong on the Chinese side of the river. The eight sleek towers of Moon Island are just a football's throw away from the factories of Sinuiju, one of North Korea's largest cities. Gu leads me to the 31st floor rooftop of the tallest of Moon Island's towers, the highest point in Dandong. "The residents have barbecues up here in the summer," she says, climbing up a staircase to the roof. "It's an observation deck with a gorgeous view of North Korea. If you look really close, you can even see Fatty Kim the Third's park down there," she says, pointing to a tiny Ferris wheel on the dilapidated shores of Sinuiju. Gu says a third of more than 1,000 apartments have been sold in these ultramodern towers overlooking North Korean factories and smokestacks. "If you traveled there, you'd see how happy North Koreans are," says Gu, who travels regularly to the North. "Sure, they're poor. But they're used to it. It's like if you don't what meat tastes like, you don't long for it. By comparison, we Chinese are under a lot of pressure to make more money. I reflect on my life every time I visit their country." But, says Gu, she always comes back to this side of the river to sell more luxury condos. -Yuhan Xu contributed research to this story.